In case you haven't read up on all the incredible things to do at Governors Island this summer, well, what are you waiting for?! We'll let it slide since this news is all the encouragement you need in order to take a trip to the car-free oasis next weekend. Just in time for Memorial Day, Adventures at Governors Island—NYC's new premier destination for recreational entertainment—opens for the season on Saturday, May 27. This is the first time folks can enjoy thrilling attractions such as a Flywire Zip Line, a 3D Climbing Challenge and the Amazen' Maze. The island already has an impressive playground (including slides for adults), but the landmark’s newest attraction, located within the island’s Western Development Zone near Liggett Terrace, will make summers in NYC extra fun. Just imagine those killer views of the Statue of Liberty while soaring through the island breeze? For more details, including how much each adventure costs, the Trust for Governors Island provided the below. Flywire Zip Line: Channel your inner superhero and soar to freedom on the most anticipated zip line in New York City. 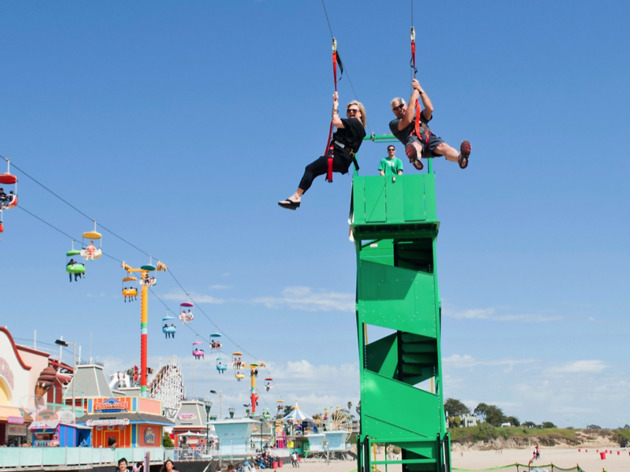 The Flywire Zip Line allows two people to zip down our 300-feet-long cable side by side and hit up to 21 mph. 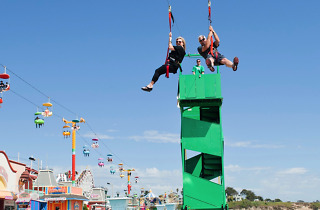 The aerial attraction has a 35-foot peak at its starting point, which is high enough to deliver a sensational ride for the experienced thrill seeker but also able to accommodate beginner adventure seekers. Perhaps best of all, the ride experience will offer sensational views of the Statue of Liberty and downtown Manhattan. Please note you must be at least 40-inches tall and 45 lbs to ride and must be less than 250 lbs. Safety harnesses must be worn. $12 or two tries for $20. Amazen’ Maze: The kid in all of us is brought to life in this exciting adventure that is pure family fun. A giant maze nearly 3,600 square feet will challenge your sense of direction and problem solving skills. Families can compete with each other or with other families. It is not just about wandering around inside looking for the exit. Kids and adults sharpen their navigation skills. Maze runners must locate four checkpoints, each with a letter they punch on their passport. The object is to spell the word "MAZE” then exit as quickly as possible. $8. Climbing Challenge: Gone are the days where rock climbing is for only the tried and tested. Participants can jump into the Climbing Challenge with any skill level. Scale your choice of three unique 25-foot walls that fit your ability. With a self-guiding belay system, each climber can choose their line and begin at their own pace. The wall challenge is fun for all ages. Please note climbers must weigh at least 40 lbs. and must be less than 250 lbs. to participate. Safety harness must be worn. $6. Adventures at Governors Island is open daily, 10am–6pm on weekends and 10am–5pm during weekdays. The only food available is from a handful of run-of-the-mill food trucks (the same dirty, aluminum ones you'll find on every corner around Times Square), two rusty ice cream trucks, and little wooden lemonade stand beer gardens that are smaller than the food trucks, with 15 rickety folding tables and chairs behind a knee-high impromptu "fence" on a public lawn. There's a corporate nod from Starbucks with a tent, and considering the quality of the rest of the offerings, you'll see most of the people wandering the island with a caramel macchiato in hand for lack of anything better. The island does NOT have "an impressive playground". There are larger metal slides, but that's it. (Google Governer's Island slides.) There's a so-called junkyard playground called play:ground the size of two Brooklyn Brownstone backyards literally strewn with junk. The signs with the name, rules and opening times are homeless-style marker-written signs, upgraded from cardboard to scrap wood. The climbing, maze and zip-lining adventures are on a single spot no more than 200 feet wide across from the 6-truck "food court". One of the few truths above is that you can see the statue of liberty while zip-lining. At ten feet high (the 35 mentioned above is certainly an exaggeration) and 100 feet in length I wouldn't say anyone's "soaring" for the five seconds your feet are off the ground. I was looking forward to doing some of this stuff but was sorely disappointed. I decided to skip the "adventures" once I saw they're all practically toddler-safe and all look like plastic backyard toys on steroids. I've posted pictures on Google Maps to save others from the same disappointment. Here's what I DO recommend on this island. Go to the center of it simply to see the buildings. It's pretty strange to see these abandoned, fancy buildings and all the abandoned yellow houses. There are also great stretches of green halfway to the north and further south which are perfect for a picnic, so bring your own food (no BBQ's allowed though), wine/beer (just be smart about it as there's a very light police presence in golf-carts), and folding chairs or a blanket. Maybe bring a kite or a soccer ball. There's plenty of space to enjoy and some nice spots with views of the Statue of Liberty. Just don't expect sunset with Lady Liberty, as the last ferry out is at 7pm.